To help improve care for high-risk foot conditions, researchers at the University of South Australia (UniSA) have developed a method for creating realistic foot ulcers involving 3D printed feet, icing sugar, chicken stock, and flexible resin. “Managing and adeptly treating severe foot conditions is an essential podiatric skill, particularly given the consistent rise in type 2 diabetes within our population,” said Dr. Helen Banwell, who developed the method with Dr. Ryan Causby. Both are researchers at UniSA. Diabetes causes more than 4,400 amputations every year in Australia. This is a world-first podiatric training initiative and involves 3D printing a foot shape with wound-like cavities and then adding the gooey mixture to a few of the models to mimic infected diabetic foot wounds. Banwell explains that there has been a 30% rise of lower limb amputation rates in the last twenty years and 85% of the cases were preceded by a foot ulcer which could have been prevented. This is where the 3D printed feet come in. Each 3D printed foot is made from thermoplastic polyurethane and takes one week to produce but costs just $4. UniSA’s podiatry team then have to get creative to create life-like ulcers and effects. Chicken stock and icing sugar work for creating foot ulcers, but the team also have to come up with ways of mimicking many other conditions from dry gangrene to oozing pus. The results enhance a student’s learning and could save limbs and lives. “The 3D foot models – and the mock injuries with which we enhance them– enable us to provide a realistic but safe learning tool for students to practice their scalpel skills before they begin clinical placements, and all without the stress or anxiety of treating a real patient,” explains Banwell. She credits new technologies with opening doors for learning every day. 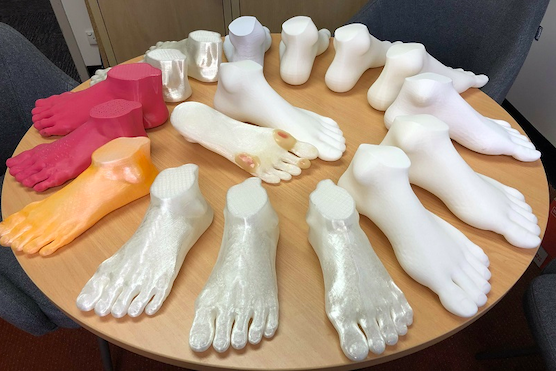 In fact, this isn’t the only 3D printing project underway at UniSA as in podiatry pediatric teaching sessions, 3D printed baby legs are also being trialed to give students hands-on experience with clubfoot casting. “When the students encounter the models, we know they’ll be pleasantly (or perhaps unpleasantly) surprised. Either way, we’re sure they’ll be gaining the confidence, techniques and critical skills that will place them steps ahead of the competition,” Banwell adds. License: The text of "University of South Australia 3D Print Feet to Teach Foot Condition Treatment" by All3DP is licensed under a Creative Commons Attribution 4.0 International License.